Imagine coming home to a warm, clean spa with jets bubbling and lights on, ready for you to enjoy after a long day at work. Or a pool whose pumps and filtration system ran during off-peak hours, saving you added hassle as well as a bundle on your energy bill. 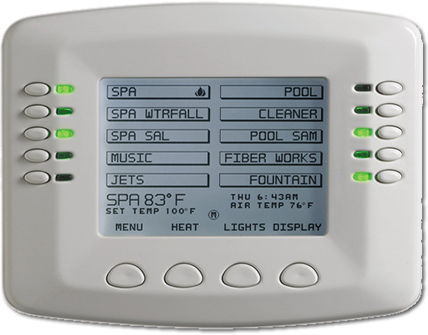 Automatic controls manage the features for your pool and spa; including: lights, pumps, filtration systems, chemical feeders, jets, heaters, and any other electrical component you may have incorporated in your landscaping. Today’s technology makes these controls especially helpful and accessible. Some controls interface with your cell phone or iPhone, giving you ultimate remote access, while others have LCD touch screens and control pads that mount inside your home to make managing your pool and spa even more convenient. If you have any questions about which system might be right for you, please don’t hesitate to contact us. Depending on the requirements of the pool owner and the complexity of the pool design, Accurate Pool & Spa’s expert staff can recommend a control system for every need. Top of the line products like the IntelliTouch® system can control your pool, spa, lighting, heating, jets, filter pumps from control pads inside the house, handheld remotes, spa-side remote controls, from a telephone call or even from your cell phone, digital tablet such as an iPad® or home computer. There are also systems that can automate pool sanitation systems, plus more basic models of control systems for those who have fewer components that need automation. We also can advise on and install water level management systems, from simple, mechanical systems through to electronic devices that can be used for residential and commercial pools; portable, custom and built-in spas; fountains and waterfalls; fishing ponds; and other decorative water features. Our customers know what they want when they are designing the look of their outdoor living space, but the technical aspects can be complicated. Let Accurate Pool & Spa help you navigate through the choices and find the right system for your pool. Let our years of experience do the hard work for you, while you worry about the pool accessories!